Dr. Deadly's Monster Scenes All Plastic Custom Builder Kit! Glows in the dark, plus three frightening faces to bring it to life! Dr. Deadly's would-be captor becomes the captive. What happens next is truly horrifying! Warning! 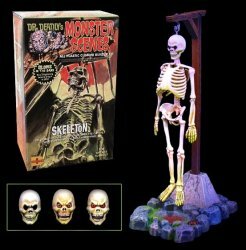 Monster Scenes Custom Builder Kits unleash an all-new experience in model building excitement. Each kit is designed to provide you options during and after assembly. As you build your kits, you choose certain elements for each sinister situation, and you decide the fate of the characters and creatures within Dr. Deadly's demented realm. Upon completion, Monster Scenes kits can be modified by way of movable and interchangeable parts. It's the unique Mix 'Em and Match 'Em feature that gives you the ability to create your own scenes and stories. What happens next will be entirely up to you! Skill Level 2. For ages 13 to adult. 1/13 scale assembly kit molded in glow in the dark plastic. Includes three different interchangeable faces, hanging post, and detailed base. Glue and paint not included. Photo shows professionally built model kit. Collectors Note: Factory sealed boxes are thin-walled cardboard, and the tight shrinkwrap may show some slight compressing of the box.